Want to give that special someone a unique gift? Give the gift of relaxation, stress relief, pain relief, general wellbeing, or increase recovery from sports and injuries. Buy one or a package of three massages; or a specific dollar amount. 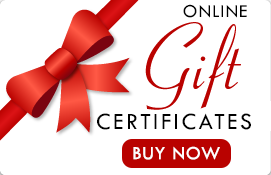 Click on BUY NOW button to buy a gift certificate that you can instantly email or print. Or, buy a lovely Heavy Stock Paper Gift Certificate in matching envelope at the Massage Studio or at your next appointment. Now accepting Spafinder, SpaWish, SpaWeek and Spa & Wellness Gift Cards. * All Gift Certificates and Packages are non-refundable.